People often miss the opportunity to enjoy what they do because they focus all their attention on the outcome, rather than savoring the steps along the way. Where does the pleasure in singing come from - finishing the song, or producing each note or phrase? ... To be overly concerned with the ultimate goal often interferes with performance. If a tennis player thinks only of winning the match, she won't be able to respond to her opponent's powerful serve ... our primary concern here is not with what constitutes a successful performance, but with the quality of experience during performance. If we agree that the bottom line of life is happiness, not success, then it makes perfect sense to say that it is the journey that counts, not reaching the destination. In education, however, the product - the grade, the final draft, the test mark - still often takes precedence over the process of learning - the sense of personal journey without which the final destination is meaningless. What is even worse is that many of our students are very comfortable with that idea. To them, school is often about "playing the game." They follow along, raise hands, submit assignments, study for tests. Of course, there is nothing wrong with these activities as long as they do not impede their progress as independent thinkers, researchers, and writers. Unfortunately, most of the time, "playing the game" means following the rules that we've set up for the students. We bring in the hoops, and the students jump through them. It's an easy process for everyone involved. In my classroom - a predominantly blogging classroom - things have to be different. I believe that it is my role as an educator to ensure that my students are given opportunities to grow as individuals, and are not treated as mere pupils who passively receive information. As a result, the traditional approach to teaching and learning, to assessment and evaluation, has to be modified. It is a difficult process for both the students and the teacher. It is a process in which the classroom becomes more of a studio where learners engage with concepts that they find interesting and personally relevant. It becomes a place where they are given opportunities to create their own networks and become experts in their chosen fields. In order to create that classroom, however, I need to continue to tweak my classroom practice. The students need a different, more conversational, expressive, and individualized kind of support. They also need to be gradually eased into their new roles of independent researchers. At the beginning of the year, I always talk to my students about "growing" their own blog. It is a challenging concept because, when they are first introduced to blogging, they are all under the impression that everything they write will be graded and that their blog is just an electronic version of their notebook or journal. So, when at the beginning of the year, I start talking about blogging and the steps that the students need to take to "grow" their own blog, they are always a bit confused and surprised - my words suggest a lot of freedom, and freedom, as we all know, is not something that students associate with school. For two years, I struggled to verbally explain the concept to them, with varying results. This year, however, I had a visual tool. I created it this past summer and could not wait to use it in class. When I finally used it last month, the results were encouraging. The students looked at it and, when I said "I'd like you to think about how you are going to grow your own blog," they knew exactly what I meant. The diagram I created is intended to help them visualize their progress over the course of a school year. It assumes that blogging is not about posting an entry in response to a homework assignment but about engaging in writing that is personally relevant. 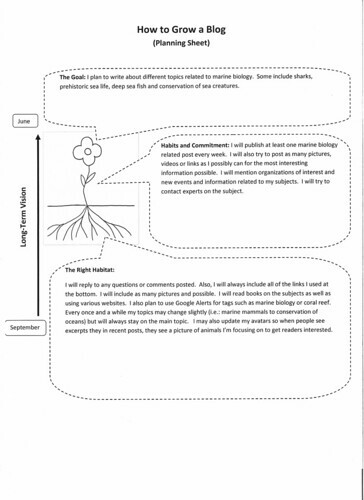 The diagram helps students define their goals and ways of reaching them. It helps them realize that blogging is not about posting well thought-out entries, and that each entry does not need to present a definitive and complete view on a given topic. Rather, it helps them see that blogging is about engaging with ideas. Blogs are perfect tools to encourage and assist students in cognitive engagement. Blogging is a process, a conversation. Unfortunately, at the beginning of the year, my students tend to see each blog entry as the equivalent of a well-composed paragraph response or even an essay. I admit, there is nothing wrong with producing well-written and well organized entries as long as the entry is not an end in itself, as long as the process of intellectual engagement does not end once the piece is posted. I want my students to understand that bloggers blog because they are on a journey, a quest, and that every entry is an opportunity to continue that journey. 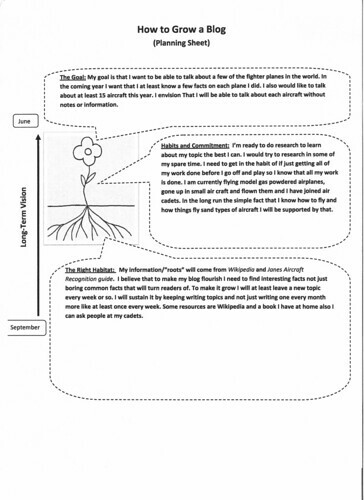 So, when they see this handout, this planning sheet, the students realize that the academic year ahead of them is an opportunity to produce a body of work, to stay engaged, to use their time productively doing things they’re interested in as opposed to completing assignments for their teacher. 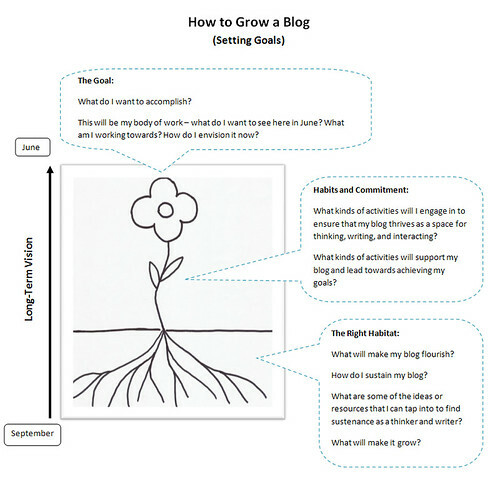 This planning sheet, called How to Grow a Blog, consists of three parts. The first part refers to the blooming flower - the goal of any gardener or a serious blogger. This is the long-term goal. When I explain this first part, I say to my students that they should think about what they want their blog to represent at the end of the year. I tell them that they need a personal goal. I say that once they start blogging, they will continue to add to their blog thus creating a body of work. "What," I ask them, "do you want to see there right before you graduate? What do you want the visitors to your blog to think when they see it in June? What do you want to accomplish?" Keep in mind, this is not easy. Generally speaking, the only time students in grade eight think about long-term goals is when they worry about grades or getting into the high school programme of their choice. Engagement with ideas lasts only until the assigned deadline. Once the assignment is handed in, the engagement ends. Blogging is very different, of course, and the diagram helps them realize that. Once they choose a personal goal, a topic that they want to pursue, I ask the students to fill in the bottom part, called "The Right Habitat." Here, the students have to think about the steps they need to take in order to create the right environment for their blogs. 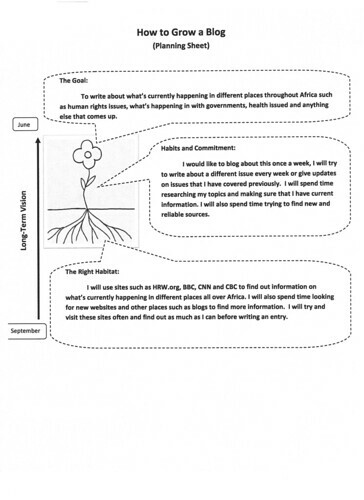 This part asks them to think about the root system for their blog. Where are the nutrients going to come from? Where will I find nourishment as a thinker and researcher? This is an opportunity to consider the fact that in order to learn and engage with ideas, one needs a habitat that will support it, and that the best way to build just such a habitat is to find other people and resources that one can converse with. 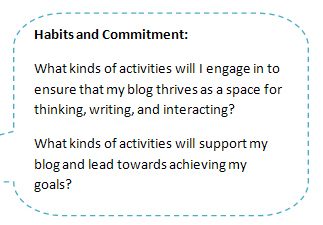 In other words, I want the students to learn that blogging is about initiating and sustaining conversations. So, I ask them, "Now that you know what you would like to research or document on your blog, where is the inspiration going to come from, where are your ideas going to come from? 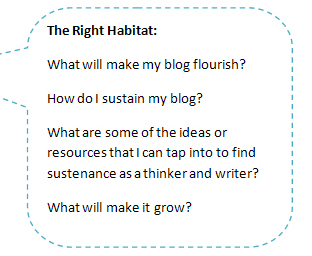 What kinds of resources are you going to include in your habitat to help you grow your blog and extend your thinking?" So, having chosen their goals, the students look for online resources that will help them learn more about their chosen topics. This is a perfect opportunity for me to make it very clear that blogs are about learning. Once they choose their topics, I always ask them how much they already know about the topic. The answers vary, of course, but fairly quickly the students realize that they do not know much about the chosen topic, even if it is something they are very passionate about. And so, a discussion about blogging turns into a discussion about learning. "Where will you go online to learn more about your chosen topic?" I ask them, "Who will you interact with and learn from?" This is how they begin to build their networks. Finally, I give them time to consider habits and commitments - that's what the stem represents in my diagram. I want them to think about the kinds of habits that, in their opinion, will be necessary to accomplish their goals. If the goal is to produce a body of work on globalization, for example, then they need to ask themselves what is required of them, on a daily and weekly basis, to achieve that goal. This is a difficult part for them to fill out because it requires a certain degree of self-knowledge. If they want their blogs to bloom, then they must think about the steps they need to take every day to ensure that they are on track. They must also know themselves and decide on the steps they need to take to develop good habits. I believe that the most effective part of this diagram is that it gives the students an opportunity to do some long-term planning, which is not an easy task because, as students, they are used to short-term goals, such as finishing tonight’s homework. At the same time, they have to think about the little steps, the daily activities and posts and where they will come from. They need to find the right habitat that will inform their work. They need to think about strategies and habits necessary to both start and continue their journey. In short, the goal of using this handout is twofold: to help students plan and begin their journey, and to think about the habits they will need for that journey. I want them to understand that the most valuable part of blogging is the process of interacting with ideas and people, not producing finished assignments on assigned topics. This planning sheet helps them define their long-term goals but, at the same time, it also helps them see that blogging is a journey. 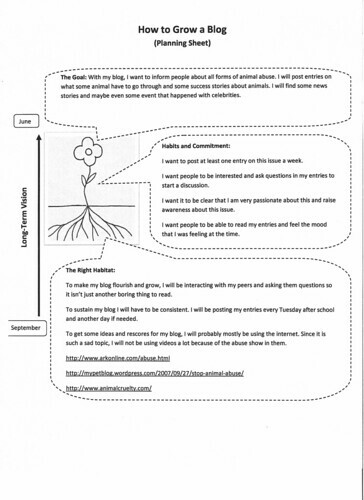 I have already noticed that this handout and the instructional conversations that it initiates help the students realize that successful learning is not about submitting definitive pieces on assigned topics, but primarily about what Csikszentmihalyi calls "the quality of experience," a sense of meaningful immersion in one's pursuits. The challenge, of course, is that the students perceive traditional school work as something that is safe, much safer than becoming an independent researcher. They often find comfort in the fact that as long as the questions are answered and the work handed in, they will continue to do well as students. Blogging, on the other hand, is initially a big unknown. There are no deadlines and no clear guidelines. After years of jumping through hoops, students are suddenly faced with a lot of freedom which they often find overwhelming. I've noticed that the planning sheet I developed can provide a solid support mechanism that many young bloggers need at the beginning of this journey. It's a good tool to use in order to start a process of conversational feedback and assessment. 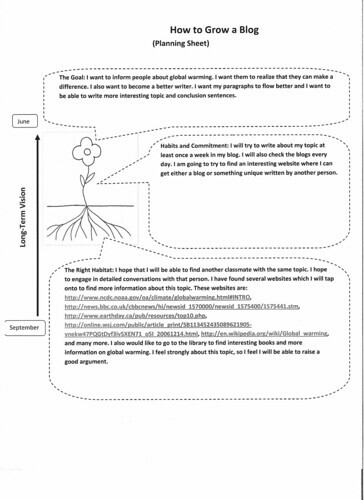 Below, you will find some examples of how my students filled out their How to Grow a Blog planning sheets. Keep in mind that what these sheets represent is the start of their journey as researchers and writers. They provide me with an opportunity to engage students in meaningful conversations that can eventually lead to meaningful and long-term personal engagement on student blogs. Your feedback on this handout and the strategy behind it would be truly appreciated. If you are interested in using or modifying this planning sheet, please feel free to download it. If you do choose to use it, either in its original or modified form, please send me your feedback.